Our goal here is not to teach fixed rules to take pictures, but to share with you our knowledge based on our own experiments. First of all, you need to choose the correct place to properly set your equipment : enough natural light and a steady table will help you to take nice photos. 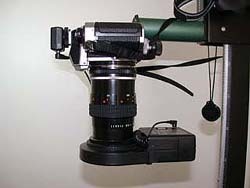 Set the camera on a tripod or enlarger table and make sure it is firmly attached. Try to put it at a level that is comfortable for you to work at to avoid the need of a chiropractic later... Artificial light can be used for digital cameras so their auto focus will work in case only low light is available. A ring flash is always the best choice. 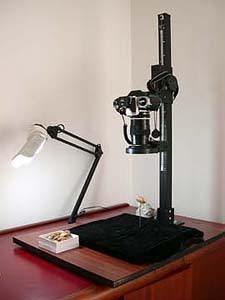 It is the easier way to get a quick and uniform light. Another trick is to use a piece of white paper or aluminum foil to reflect natural light to eliminate or reduce shadows. Just be careful to not redirect the light to the lenses or the auto focus won't work (and it can be very annoying). 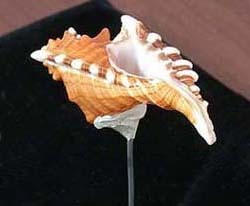 Make a pin to elevate the shell from the background, using a metal wire or similar material. This method will blur the background and reduce the shadow. Stick the pin into a piece of wood so it is steady enough to hold heavier shells. Use putty to hold the shell on the top of the pin (you can buy this material in office supply stores). 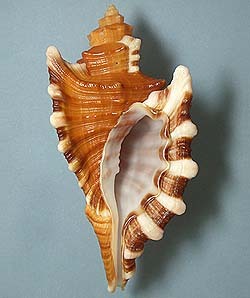 One of most common mistakes is to put the shell directly on the background, making a hard shadow. If you keep this background on your picture the final result will be very bad. 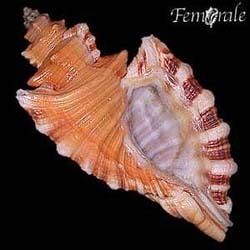 Many will suggest a background in a completely different color from the shell. 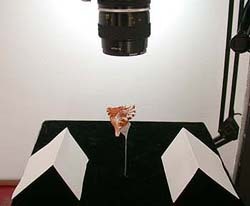 See the photo above where we used a blue background to take a picture of a Cypraea. Shiny shells always produce a reflection of the background, which is very difficult to remove even digitally. So try to use a dark black velvet to make sure nothing will show. 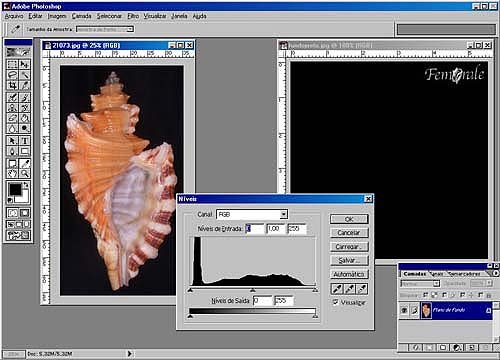 On darker shells you can use a white piece of paper and later treat the photo on a photo editor. If you are going to send the picture only to a friend then there is not much work to be done. However, if you wish to use it on a website or print it, then you need to work using a good photo editor. We use Photoshop®, but there are many good brands on the market. 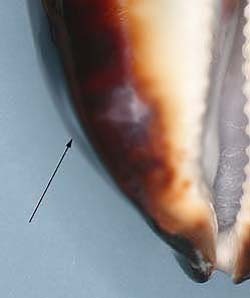 In most cases you will have to "cut" along the border of the shell to clean the background, and to adjust sizes and position on the final photo. Also, you may find it necessary to adjust levels and colors. Remember, the less you adjust, the better the photo will be. Even if you know how to make an awful picture into a reasonable one, try to make the original as good as possible to avoid excessive work. The better you click, the less work you will have: only imagine the time it would take if we had to work for several minutes on each of our pictures, since we take more than 200 pictures every week for our website and list! Adjust the size of the original picture on the camera. If you have a CD recorder and wish to keep good originals, then adjust the camera on the higher definition or close to it. If you are going to work with a large file, remember you will need a good computer with large memory and good processor. Make a standard background to use in all photos, and save it using an original name like... background.jpg. Try to learn a little bit about how to work with your photo editor - you can do a great job with it. Also you can have a lot of fun!